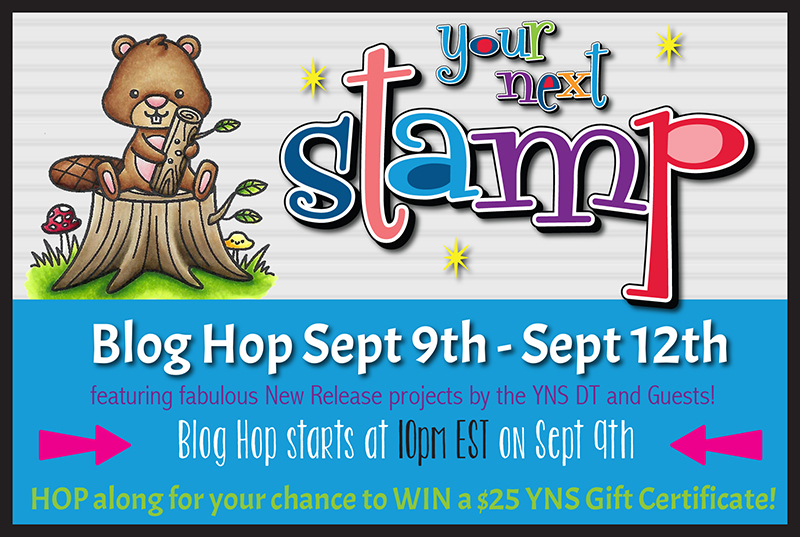 Hollybeary Creations : YNS September Release Hop!! 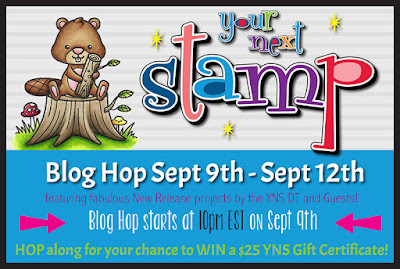 Who's ready for the September Release from Your Next Stamp???? This release is full of everything you need for your Fall projects!! Hop along with the Design Team and a few Guest and leave comments along the way for a chance to win a $25 GC to the store. My first project features the super cute Scarf Weather set and dies and the new Insta Love Dies. I stamped the tree onto a White card base and then I colored in a portion of the image "Spotlighting" it with the coloring and the Insta Love Die. I added a few retired Gumdrops for an extra pop of Color! My second card uses the Peek a Boo Set and Dies. I love the characters in this set. 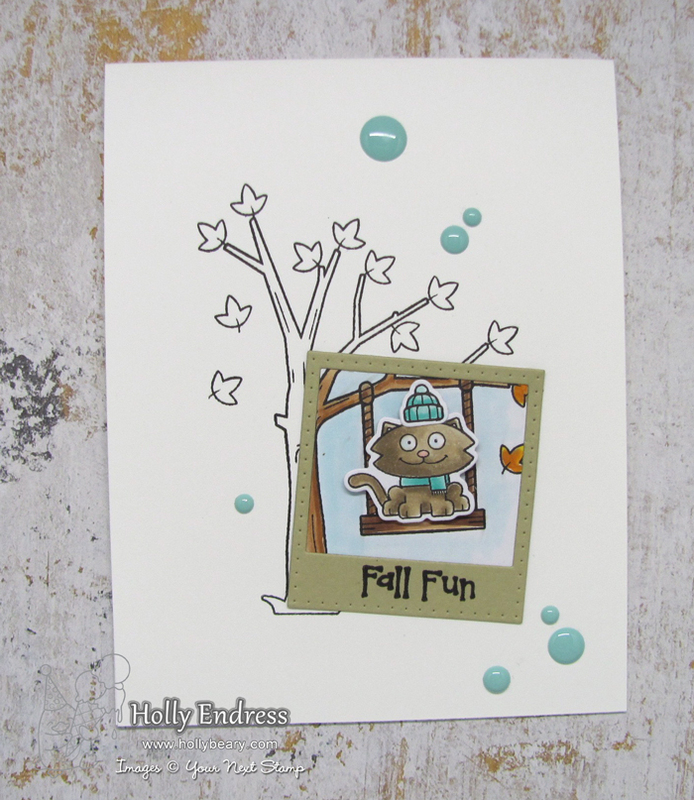 I also used the new Star Panel die and the Gorgeous Fabulous Fall paper pad. I die cut the Star Panel from some Kraft card stock and added a piece of the pattern paper behind it with some foam tape then I adhered the panel to a Kraft Card base. I stamped the sentiment in Black Olive ink from YNS. I stamped the image onto some X-press it blending cardstock with Black Olive ink (Copic Friendly) and I colored it in with Copics and used the coordinating dies to cut it out. I adhered it over the Star Panel with some Foam tape. We have a special in the store as well this week so it's a great time to grab your Favorites!! You are so talented! I love what you did with both projects! Cuteness all around! The spotlighting is so effective with the frame. Oh my goodness !! Your cards are sooooo adorable ! On the first one, you had a great idea to color only what's inside the Insta frame, I really love that ! I might steal you that at some point.... and the second card, beside being adorable, I really love the color combo. Great job !! Fall fun indeed! Lovely creations - thanks for sharing and helping to ignite our creativity too! Wow Love your cards! The first one I love the positive negative effect with the tree not colored and the picture standing out! Really cool! the second is superb with the cool stars everywhere! Always looking for new things to try thank you for the inspiration! Both super cute cards! I love that star panel!! Cute cards! I love YNS dies... they are so creative. Love your cards! What a clever idea to only color what's in the frame on your first card. In the first card I love how everything is black and white except for what's inside the Insta Love frame. In the second card you really showcased the Star Panel. Your color palette is great. Both are such cute cards. I love love love that star cut out panel and how you used it! Very creative!! Love the Fall colors! Love how you framed the swing. oh super cute! love how you just coloring that one section! Both are cute. I like the spotlight look on the first card using the new die. Sweet creation with this fabulous release! 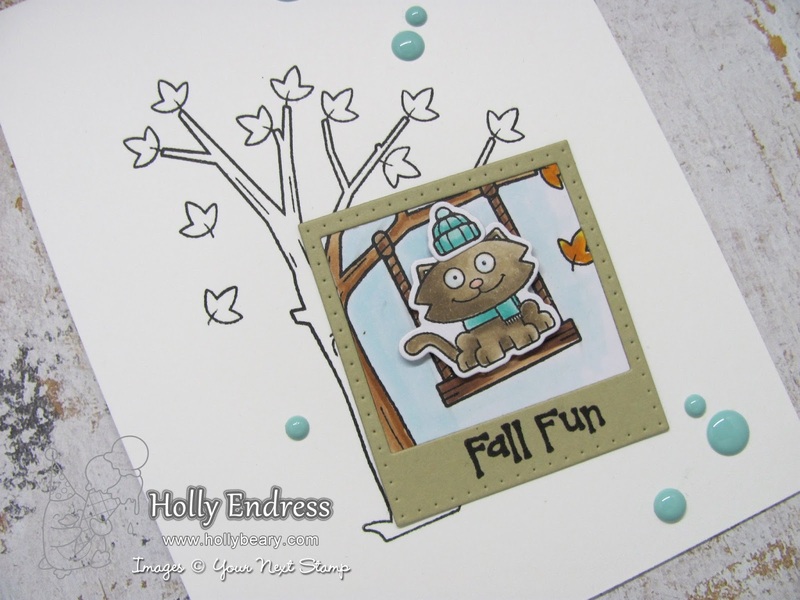 Oh my gosh, I love both of these cards, and the spotlight technique is one of my favorites for autumn cards, it really makes all the colors pop! Cute cards. I really like the star panel. Both of your cards are adorable! I love how you highlighted the cat on the swing with the polaroid frame. It's so clever and cute! Your "hello" card is very cute, too! Great cards. Love the starry background. Fun cards! Love the idea of having it black and white and then adding the color to a portion. Both your cards are adorable!!! Love them!!! super cute cards! I love the 1st one how the color is only inside the frame, really neat! Both designs are adorable, Holly. But I really like the spotlight technique of the first card! The first card is absolutely stunning! I love both, this release is so good! pretty cards. Love the images. Oh my gosh...your cards with this new release are fantastic! GREAT job! Such fun cards! I love the star background die. Love the new release!